Frigidaire designs several different oven models, each with a different set of features to meet consumer demand. A feature found on some Frigidaire ovens is a convection option, which offers an alternate method of cooking your food. When the convection feature is activated, a fan turns on, circulating warm air through the oven. 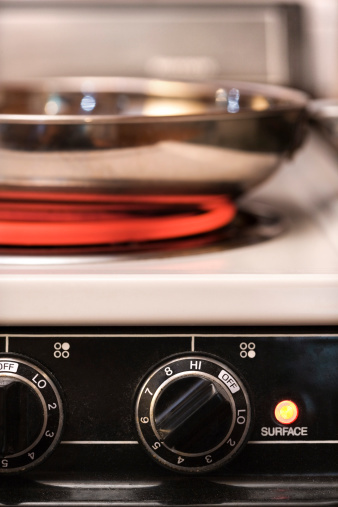 Circulating air cooks food up to 30 percent faster and at lower temperatures, saving you money on your energy bills. When using the convection feature on your Frigidaire oven, you need to preheat the oven to obtain the best results. First, move the racks inside of the oven to the desired position. Preheat the oven by pressing the "Convect" button on the control panel. The display screen will blink "Convect" and "Bake," and "350" will appear as the temperature. Adjust the temperature according to the recipe by pressing the corresponding numbers on the number pad, then press the "Start" button. While the oven heats up, the actual temperature of the oven will appear on the display. Do not place your food in the oven until the oven temperature matches the temperature called for in the recipe. Press the "Cancel" button to stop the oven from preheating. Because convection cooking uses circulated air, it's important that you don't inadvertently block airflow. Always bake cookies, biscuits and other items on cookie sheets that don't have sides or lips. While baking cookies in a pan with short sides, called a jelly roll pan, works in conventional baking, it may result in undercooked items in a convection oven. Convection and conventional baking are the same, however, in that darkly coated cookie sheets and baking pans may cook food more quickly. Convection cooking generally requires a cooking temperature of approximately 25 degrees less than the temperature called for in the recipe. You can figure out this adjustment yourself when entering the cooking temperature, or you can use the "Convection Convert" feature on the oven. To use the "Convection Convert" feature, press the "Convect" button and enter the recipe temperature, which will appear in the display. Press the "Convection Convert" button to automatically adjust the temperature. The display will change to a temperature 25 degrees less than the original temperature entered. Press the "Start" button to begin preheating your oven. Convection cooking is faster than traditional oven baking, so some Frigidaire models remind you to check your food. 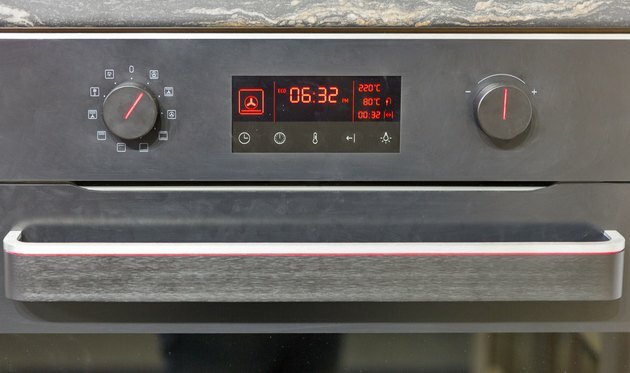 When using the convection convert feature, these models will sound three beeps and display "CF" when the oven is 75 percent of the way through the set cooking time. These beeps allow you to check the oven and remove your food if it's done cooking. If you leave the food in the oven, the oven will finish the cooking cycle. When it has, it will sound a long beep every 30 seconds until you turn the oven off. The display will read "End" when the cooking time is up. In addition to the "Convect Bake" feature, you have the option to use the "Convect Roast" and "Convect Broil" features. Like "Convect Bake," these features allow you to roast and broil foods a bit faster than you normally could. The "Convect Bake" feature is best when cooking food on multiple racks. The "Convect Roast" setting is best for cooking meats, and "Convect Broil" broil is best for thicker cuts of meat. The "Broil" and "Convect Broil" settings cook food in the main oven compartment, as Frigidaire ovens do not have separate broilers. To switch between the different modes, press the "Convect" button until the name of the desired mode appears in the display.